We invite you to enjoy the tastes of freshly made-to-order sushi in dozens of varieties. 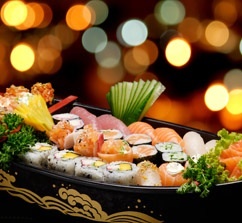 The Sushi On Oracle menu offers your favorite traditional Japanese dishes as well as unique creations made by our skilled master chefs. We serve only the freshest cuts of fish prepared in our unique style so that you can enjoy the best sushi in Tucson! Toro is a premium cut of fatty tuna with a unique richness. Smelt roe or masago with quail egg is a delicious combination.